Blame the phone..! UI design and elderly smartphone users. Photo (CC BY) J Stimp. As I mentioned in my previous post, a first step in my ethnography of the experience of ageing and the use of smartphones involved volunteering at a cultural center in the working-class neighborhood where I am living in Santiago de Chile. 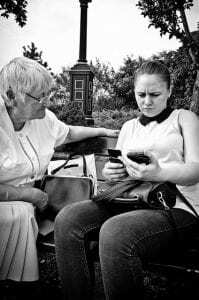 For a couple of months, I have been a teacher’s assistant in two workshops on the usage of smartphones aimed at elderly people. In these workshops lasting for four weeks, enthusiastic grey-haired students learn the basics of smartphones settings (unblocking the phone, connecting to Wi-Fi, turning on and off the GPS, flight mode and the like), how to use the Camera app, Whatsapp and Google Maps. In addition, for a couple of weeks, I have been giving a complementary workshop by myself, for those who have already finished the main workshop. This complementary workshop focuses on repetition and exercising: students have the opportunity to practice in more extended periods of time what they have learnt in the first workshop, and to go step-by-step over and over again. This complementary workshop has given me the opportunity to be in more frequent contact with the students, and to become more familiar with their struggles and their success in mastering this nowadays pervasive new device. Many of the difficulties I noticed have been also spotted by my colleague Marilia Pereira in her field site in Brazil. One of the most common feelings expressed by the students at the beginning is frustration: the phone doesn’t do what the teacher has just shown, the screen goes off all of a sudden, or cryptic warnings pop up, among other things. In my short experience so far, the most common —yet invisible— difficulty lies in the touch interface. Many elderly students find it difficult to distinguish between a ‘tap’ and a ‘long press’, and they tend to do a ‘long press’ when a ‘tap’ is required. I believe it is related to the lack of self-confidence when using the smartphone: they press the button long enough to be sure they are pressing it (as with a door bell). The problem though, is that the long press is a different input and therefore produces a result other than the expected one. Another difficulty lies in hitting the exact right spot on the screen, as, again, a slight miss has a different outcome (e.g. on Android’s Whatsapp’s chats menu, hitting the contact picture will show you that picture, hitting just a little to the right will open the chat), contributing to the general feeling of frustration. Another common experience is the feeling of being overwhelmed by the vast array of menus, gestures, and different ways to do the same things on the smartphone. Having shared many classes with these elderly students, I started to grasp the experience from their point of view. Considering the difficulties of the touch UI, the diversity of Android iterations, manufacturer’s software skins, etc., I can see how complex and overwhelming this experience might be. All the functions of the phone seem chaotic to me now: there is no clear logical hierarchy in the arrangement of apps and functions. Most of the students do not recognize the difference between the home screens and the app drawer (the majority have Android devices), especially when the wallpaper in the app drawer is the same as on the home screens (but, adding to the confusion, this does not happen with every phone). One old man did this to access the camera: instead of tapping the camera icon on the home screen, he would tap the app drawer icon, and then the camera icon inside the app drawer. Furthermore, as the teacher of the main workshop pointed out, they expect to learn the ‘one way’ to do something on the phone, while multiple ways are possible (and sometimes these are needed, when one of the ways does not work). In these situations of frustration, they tend to blame themselves (“I don’t understand technology” or “my head is not good for this”) as they judge themselves unable of learning the intricacies of this device, which seem evident for their grandchildren (who don’t have the time nor the patience to teach them). Having experienced this frustration myself when trying to teach a simple procedure to a new student whose specific smartphone model I have never used, I wish they would allow themselves to blame the phone now and then (I certainly do). Sometimes the interface is not as intuitive as it should be, sometimes too many shortcuts stay in the way and sometimes there is no visual cue on where to tap (the flat design of previous years has made this worse). However, I must say that they blame the phone sometimes, but in the most radical way: ‘this phone does not work’ (therefore, it must be changed). This has happened when they had accidentally left the phone in flight mode or silent mode, and they were unable to either receive phone calls or hear them, respectively. It is as if they could see the problem only in themselves or in the hardware (the phone as a device), while the software (and UI design) remains a blind spot. The interface is there, yet it goes unnoticed. All in all, this is just the beginning of a long path for these new old beginners. It will be interesting to see if, as the workshop progresses, these engaged learners build up more self-confidence and make their way through the garden of forking paths of mobile UI.